MY parents were born of poor parents; they were poor also when they married, about 1893, having nothing for all their fortune but their health and their hands." In these words Laetitia Lefèvre of the hamlet of Canisy, in the Department of the Somme, begins her "Mémoires d'une Picarde envahie pendant la grande guerre. 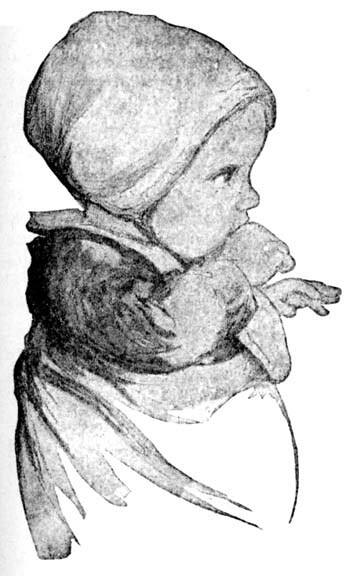 "(1) "I was born," she continues, "one year after, and two years later I bad a tiny sister. My father worked a little on farms in summer, and in winter in a sugar factory. As for my mother, she toiled at her profession of market gardening, as her father, as her grandparents, had done. When by dint of privations and of labor, my parents had saved a little money, the idea came to Mama to work her garden for herself, and to sell for herself its produce to the extent of its capacity. So she commenced to peddle her vegetables with a wheelbarrow. But one day my father left his factory to work with her. "Meantime my sister and I began to grow up; we went together to the only school of the little village of Canisy, where we were born; there we received a sufficiently good education, thanks to the help of a good teacher, and as soon as our parents judged that we were sufficiently educated, they took us from the school to aid them, in the profession that we were to carry on. For my part, I should have preferred my studies, but a serious illness of my father's prevented me from continuing. As for my sister, she loved the soil. Of a stronger physique than I, she was already a hard worker at the age of eleven. "My parents had rented some land in bad condition; they bought an old horse, and an old wagon, to carry the vegetables; things were beginning to go not so badly when my father fell ill. . . . It was with a heavy heart that I quitted my books. But I saw my mother crying, and intelligence made me understand, although I was not yet eleven, that I must care for my father as well as my mother who worked in our marshes from morning till night. How many times have I not surprised my parents asking each other with anguish if they would not be obliged to sell everything to pay for the bread that their children lacked for the morrow . . . But at length health slowly returned; with health, vigor and courage; and Papa set himself once again more courageously to work. We were then four strong. Several years passed thus, and toward 1912 we were well installed; in 1911 my parents had bought a house both imposing and vast, our aged horse had been replaced by a young one, pretty and strong; we had also two cows. In short, the year 1914 found us in the full flower of prosperity; everything was beautiful in our gardens; we had superb vegetables, lovely fruits of all kinds, sleek cattle. I was then nineteen and my sister seventeen. We had saved a little money, and we could endure without fear the evil days. "Then at a blow, oh, horror! in July, 1914, they talk of war, yes, of war. An heir to the throne of Austria has been assassinated, and the old Emperor Francis Joseph wishes to punish the assassin by arms. The assassin appears to be a Serbian, but is it possible that for one criminal war will be made upon an entire people? Oh, no, that cannot be! But alas! our papers inform us that Austria has declared war upon Serbia,---what is that little people to do against a great nation like Austria? But they say again that Russia is mobilizing, that Germany, Germany who is not to be a stranger either in the drama of Austria, is mobilizing also. And our France, what ought she to do on seeing a the preparations of the other nations? She, she too, must mobilize. But she does not believe war possible; Oh, no, everything is going to come out right, and this will be nothing but a bad dream. "Alas I it is not a dream. The third of August, 1914, the German ambassador at Paris makes known to the French Government that a state of war exists between his country and ours. He quits Paris precipitately to cross the frontier." "This time no longer any doubt that the enemy are going to quit us. But will that leave us tranquil? Oh, no! Everything has gone little by little, and to-day nothing remains to us except some pieces of furniture in the house which no doubt we shall have to let go to-morrow. For, without question, they are going to leave this land of Picardy, which they wished to make their own,---but we shall leave it too. Everything is quite ready; they can go. The French and the Allies will come; they will find nothing but ruins, since the invaders in their cruelty will leave them nothing else. We are not working any more; what is the use? The men are always forced to, but we women,---they wished us to take up our potatoes out of our cellars, but we refused, so they took them themselves. This afternoon it will be the turn of the hens and rabbits which remain. "February 15. The men have once more gone to work, but at noon the soldier who guards them says it is all over. "At three o'clock in the afternoon, the mayor comes to notify us that we are to be evacuated this night with seventy-five citizens of Canisy, and that we must provide ourselves with a bundle to carry by hand, and with food for one day. Oh, what cruelty! We have no longer any courage. And it is without courage, and with eyes streaming with tears, that we tie up a little linen. Oh, to go, to leave everything,---for the little they have allowed us till now, we must abandon, and go, we know not whither. Every sound person goes. All the aged and the women with little children remain. What are they going to do with them? And when we asked some soldiers who were pitying us: 'You,' they say, 'are to work; the aged, the women and the children are to be an embarrassment to the French who are coming and will encounter nothing but ruins and people incapable of doing anything for their own nourishment. For nothing will remain of your houses; they will be blown up.' Shall we then never be delivered? How long shall endure this accursed war? "February 16. In the night, at two o'clock, we are summoned by a bell which gives the order to depart. We have no need of the bell because we have not slept. We present ourselves at headquarters, where we are subjected to being counted and requested to climb into wagons with our small luggage. On account of friendly [allied] aeroplanes overhead, we are forbidden to make any light; thus at a signal from the wagon master the wagons start slowly. There are cries and sobs from those who go and those who stay. It is the despair of parting and of not knowing whither one goes. We pass our house, already invaded by soldiers. One last look, one last farewell, and it is the end. Poor, dear Canisy, when shall we return to thee, when and how?" Not in one village, but in all the villages of the Oise, the Aisne and the Somme from which the enemy was preparing his retreat in the spring of 1917, the tragedies described by this peasant girl of Canisy were being enacted. fifteen hundred and eighty square miles of territory were systematically depopulated and laid waste. During this period of pillage and evacuation, in this same month of February, 1917, the Germans, intensifying their submarine campaign, executed another of their acts of frightfulness. On Sunday, February 25, at half past ten at night, in a heavy sea, one hundred and fifty miles west of Fastnet, the passenger liner Laconia was torpedoed without warning. The sinking of the Laconia, subsequent to our severing of diplomatic relations with Germany, was the "overt act" which brought America into the war. But to Smith College and to Canisy it held a significance of which each was unaware. In one of the thirteen boats launched from the sinking ship were Elizabeth Hoy, a graduate of Smith in the class of 1898, and her mother, returning to England from their Christmas holidays in America. The lifeboats were awash with icy water, tossed by huge waves. A passenger addressed the captain of the submarine which had risen to the surface to survey its handiwork. "Don't you know," said he, "that you are torpedoing a boat containing women and children?" "Oh, they are all right for a few hours and a patrol boat will take them all up," the Captain replied. But in the five hours before Lifeboat No. 8 was picked up, seven persons had died in it of exposure. Among them were Mrs. Hoy and her daughter. Two months after the torpedoing of the Laconia, in April, 1917, Mrs. Hawes spoke by invitation at an informal luncheon given by the Smith College Club of Boston. The subject matter of that speech was a complete surprise to the guests; but before the close of the luncheon, $4,000 had been pledged for the sending of a Smith College Relief Unit to work for the women and the children---the "useless mouths"---left by the Germans in the ruins of devastated France. What was to be the aim of this Unit and how was it to operate? Mrs. Hawes answered these questions at Commencement time before the alumnæ body in dramatic words. "In a very cordial letter which I received one week ago, your president, Mrs. Alice Lord Parsons, invited me to tell the Alumnæ Association to-day about the plans for the Smith College Relief Unit. I have never approached a great opportunity with more serious misgiving. "The point of view revealed by this meeting and my point of view are very different. To you the outlook is quite bright, to me it is very dark indeed. To you the needs of the world, the needs of the College-seem to be as usual; to me nothing seems as usual. The war is the only thing on the horizon. . . . Last year I did not come to Commencement; I had returned from Europe only a few weeks before and would have been as a skeleton at a feast. This year when I was asked to tell about my experiences in Europe at our class supper I could not do it. For no one can come into contact with the Great War and not be permanently saddened by it. "In my ears the call to college women rings as clear as ever, perhaps clearer than ever before---a call of need for their steadfastness, their moderation, their good sense, their special proficiency, their esprit de corps, to help actively in this tremendous conflict for the right. . . .
"But if the work needs us, we most certainly need the work. What Smith College needs more than anything else, more than any building or equipment, is a body of traditions. . . . We have one tradition of immeasurable value---you all know what it is---President Seelye; we have another mention of which I deeply regret has been dropped from our catalog. In old times the catalog began (I quote from memory), 'Smith College is situated in a town which for more than 150 years has been noted for the culture and refinement of its inhabitants.' But these two traditions have been made for us. We must now make for ourselves and no tradition can be better than that of united public service. . . .
"Now as to the plan. We must not be too definite. . . . We must be ready to pour ourselves into any mold of service that presents itself. . . . A final plan for civilian relief has probably not yet been formed. . . . We need at least $30,000 for our Unit; $10,000 for cars and other upkeep; $10,000 for support of the Unit, $10,000 for relief supplies. . . .
"Does the plan as I have outlined it, three or four cars, eight chauffeurs, eight social workers, a depot of distribution in touch with the French authorities, affiliation with the American Fund for French Wounded, commend itself to you? I am sure there must be doubts, uncertainties in your minds. I beg you to state them and I will answer them to the best of my ability. "But decide before you leave Northampton whether you want the Unit to go, for delay is the chief abomination in war-time. You have it in your hands through your own friends and special representatives to make children live and smile again, to make old people, if they cannot smile, yet take heart in response to acts of friendship from strangers in place of the cruelty strangers have meted out to them in the last two years. If you find you can help more effectively through other channels and with as great good to the College, I shall return happy to my country home, for I assure you that in offering to start this work of Smith women (and I hope other women) in France, and to leave my children for this purpose, I am as it were preparing my own execution. But all is very well with my children, and there are other children across the sea with whom all is not well, all is horribly wrong, and their lives also are precious in the sight of God." ON the twelfth of August, 1917, the Rochambeau, as she had done practically every month since the beginning of the war, dropped anchor at the base of the white lighthouse that guards the entrance to the Garonne. Her voyage had been uneventful; her redcapped gunners at prow and stern had watched the gymnastic drills of the Smith College Relief Unit with as much attention as the unvexed expanse of the sea. Even the moon had lighted us without treachery to our haven. As we voyaged the following morning up the river to Bordeaux, no scene could have been more peaceful. Red-winged fishing smacks, outward bound, golden harvests fringing the shores, trellised vineyards, silver poplars, medieval hill towns,---all washed in a haze which was yet tenacious enough to carry, motionless, its stately galleons of clouds. Remote from war as an old print, or a reverie of summer, was the Garonne. To the Unit, fresh from an official farewell where they had been likened to the heroic women of all time, and dedicated to a solemn college tradition, Bordeaux came as an anticlimax and a delight. Responsibilities, anxieties,---what are they to youth but the stuff of which adventure is made? Our seventeen members were gathered from fourteen classes, ranging from 1888 to 1914, but though the years had made of some of us archæologists, doctors, teachers and social workers, we were all volunteers. To the cheers of fellow volunteers of the American Ambulance and the American Engineers, we disembarked. At Bordeaux we were heavily loaded, having brought with us in trunks, duffles and boxes as much of our equipment as possible. This included camp beds, blankets, carpenter's tools, food, automobile parts and clothing for distribution. There had previously been forwarded by freight three automobiles (one White truck, one Ford truck and one Ford jitney), six portable houses and stoves for the same. These had all arrived safely in France---a most fortunate circumstance, putting us at once on an independent, self-supporting basis. With money, housing, supplies and transportation---above all transportation ---we could hope to be of use. In Paris, we were made welcome at the Headquarters of the American Fund for French Wounded. The French Government, through them, had already assigned us a post in the devastated area, an advance post, as such assignments went among women's units, fifteen miles behind the front line trenches in the Somme. Famous for centuries in the annals of Picardy, its name was in itself a tradition and a challenge: Château Robécourt, Grécourt. Upon it depended for relief---as in feudal times had depended for defense---sixteen outlying villages. But although our sector was only seventy-five miles from Paris, it took a month of effort to get the Unit there. In the first place, there were stringent war-time regulations. Our arrival, residence, ancestry, attributes, intentions and photographs had to be registered with the Prefecture in Paris. In return for this information we received in due course a permit of residence. We also registered ourselves with much more circumstance, sponsored by Mrs. Dike and Miss Morgan of the Civilian Section of the American Fund for French Wounded, at the Ministry of War. Thence through the Third French Army to which we were to be assigned came also in time permits of travel and of circulation, both by train and automobile, to, from and in our villages. A third set of permits must be secured for our chauffeurs, and a fourth for our cars themselves, to entitle us to the use of gasoline. For the transportation of freight another special permit was reserved. Meantime neither freight nor cars had come through from the seaport of St. Nazaire to Paris. The docks were choked with American Army supplies, the railroads taxed beyond capacity in hurrying men and ammunition to a front which extended in a vast semicircle from the pivot of Verdun. About Ypres was raging in those summer days the Battle of Flanders; from Verdun itself was being launched the successful offensive which recovered to the French Mort-Homme and Hill 304, "the key to the eastern front." Our headquarters on the Quai Voltaire shook often with troop trains passing underground to the Quai d'Orsay Station; the staccato of cavalry, magnified by the sounding board of the Seine, disturbed our midnights; avions even then started out of the northern sky to course like stars among the constellations; convoys, soup-kitchens, rumbling artillery defiled eastward or westward in dimly seen lines. But of all this we were aware only at night. The Director and Assistant Director of the Unit found their days taken up with interviews and consultations. The Executive Committee of five scoured war-time Paris for additional supplies and merchandise. Hampers of Quimper ware for our own table, batteries de cuisine, lumber, sabots, galoshes, felt slippers, felt shoes with or without leather soles, wrappers, skirts, underwear, cloaks, capes, mufflers, kerchiefs, caps, sheets, blankets, sewing machines, wool, soap, toys, farm implements and books, began to fill our store-room at the hotel. Larger consignments were sent direct to the depot of army transport, detailed for civilian relief, which undertook to deliver them at the Château. We also purchased through an agent our first livestock, consisting of six cows, three pigs, poultry and rabbits, all to be shipped direct from Brittany to the Somme. The residue of the Unit occupied itself in nursing, making surgical dressings, splints and special shoes for the wounded, pillows for hospital trains, and in packing or unpacking cases of supplies at the ware-rooms of the American Fund. We bad ceased to be spectators. Like all the world around us, the tentacles of the War had sucked us in. Meantime, our Director had been taken by the American Fund for French Wounded on a tour of inspection to our ruined estates. She came back brimming with an enthusiasm which admitted no further obstacle. On the night of August thirty-first, she and five chauffeurs boarded a train for St. Nazaire, where our automobiles and our houses were still held. "Our property," she wrote later, "was found on a quay, on a freight car, and stacked in the freight yard. To get the cases together, unship and put together the cars, haul them to the garage and get them in running condition,. took four days' very hard work." But three days later, we saw the cars draw up before our hotel in Paris. At last we were ready to start for the front. THE ancient signorial fief of Grécourt, consisting of an "old Château with its enclosure of about six hectares, and of seventeen hectares of tillable land," owed allegiance in feudal times to the Marquisate of Nesle. It dates, we read, only from the eleventh century. It never had a chart of enfranchisement as a commune, but it was formed into a parish, with its own church, its priest and its tithes, on St. Matthew's Day, the twenty-first of September, 1239. In September, 1917, its present châtelaine, the Baronne de Robécourt, transferred, for the time being, its "precarious title" to us. "Madame," she wrote to the Director of the Unit, "I am so happy that what remains of my Château of Robécourt, which I love so much, should be under your protection. That consoles me a little for the great sorrow I feel in seeing it as good as ruined by those Barbarians. I admire so much the good you are doing in coming to the help of this Poor Country and of its unhappy inhabitants. . . .Please accept, Madame, the assurance of my distinguished consideration. Baronne de Robécourt." In those feudal days, when our tiny estate was itself the seat of civil strife between the rival houses of Robécourt and of Grécourt, the approach to it was not more adventurous than ours during the Great War. The Wood of Clovis, the Ford of the Wolves, the Field of Battle, the Captain's Close,---these names of medieval encounter could be pointed out in our day as the sites of German batteries, of dynamited bridges, of encampments and aerodromes. Nor was any feudal seneschal summoned from his sleep more glad to let down. the drawbridge for his overlord than Marie, the faithful concierge of the Baroness, to open the gates on our arrival to us. It made no difference that the hour was nearly midnight. Coffee must be served. And the villagers of Grécourt, numbering twenty-five women and three little children, came from their shelters in the stables to bid us welcome to our home. The start from Paris had been made that morning with the cars all loaded to capacity and carrying six pioneer members of the Unit. The road lay through Chantilly, Senlis, the lovely Forest of Compiegne, and from Compiègne itself up the valley of the Oise to Noyon. Camions, marching regiments, aeroplanes overhead, gave a warlike aspect to the military highway that stretched northward, hard and fit, beneath its arcade of elms. So, two thousand years ago, ran Cæsar's road linking Amiens to Rome. But the unbroken forests of that day had given place to rolling harvests brightened by poppies and to terracotta villages embowered in orchards and the smoke of burning leaves. At intervals, blue uniformed sentries stepped out to halt the cars, demanding safe conducts. Near Noyon, the ravages of combat became evident. We saw for the first time a trench, a dugout, trees shredded by bombardment, wire entanglements, wooden crosses brave with the tricolor, the empty shells of villages gaping like skulls. Our party drew into Noyon in good order, and halted in the square before the as yet undestroyed, beautiful Hôtel de Ville. There the first accident befell us. One of the cars refused to proceed. The French army, which we were soon to know so well, came to the rescue. At dusk the Unit was once more under way, headed by a military camion to which the load of the crippled car had been transferred. Although the twilights linger above the plain of Picardy, darkness overtook us, and each crossroad, so plainly marked in day time with enormous lettering, had to be deciphered with a lantern. la all the silent stretch of country, there was no friendly lighted village where one might stop at a tavern to inquire the way. Here and there was a huddle of ruins, or a bivouac, or a wood, doubly dark, but for the most part only the vague plain, the myriad stars and the thread of the road between. So the Unit came to Grécourt. It camped that night on blankets on the floors of the new baraques the Army had already erected for it. With the first light, it was up and out for a survey. The baraques themselves, three in a row, were placed on the edge of a little meadow which had formerly been a semi-circular lawn. On the east, the ruined esplanade of the Château led down to it. 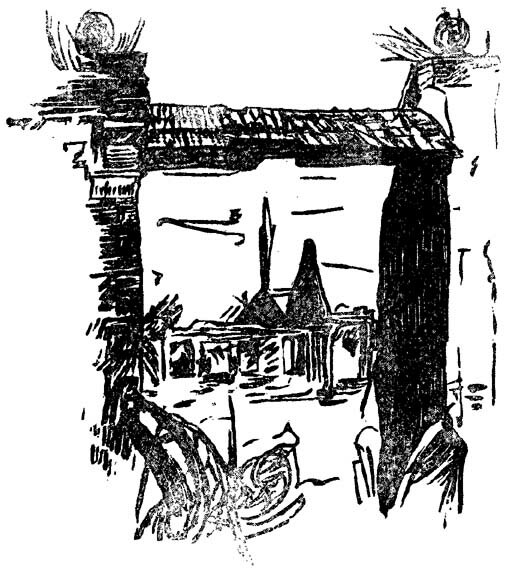 As one climbed over the débris of fallen walls into the unroofed interior, one looked through the frame of an ample doorway across this greensward to a broken sundial, from which radiated the alleys of the wood. It was a noble wood of oak and chestnut and dappled plane trees, and even after the leaves fell, perennially green with ivy and mistletoe. But it had been shamefully used by its German conquerors. Corvées of Russian prisoners had felled and laid waste until half of it was reduced to scrub. Here and there in the undergrowth were prone trunks of giant oaks sawed in sections, ready to be exported to Germany. The avenue of cypresses and poplars leading from the road to the Château gate had suffered more, because more senselessly, from German vandalism. Half the trees were down and laid symmetrically away from the thoroughfare. Even the poplars along the footpath from the Calvary to the tiny church had been lopped.. As for the village itself, only the church was standing, and the remnant of its inhabitants were wondering where they could go next, since they had been ordered by the Army to vacate their quarters in the stables to us. On this point, we reassured them. We had for housing the three baraques, each of two rooms, already mentioned, six portable houses in prospect, an orangerie of some forty by twenty feet with a good roof, albeit the glass of its great windows lay shivered to atoms, a small room with a door and a window almost intact built beside a greenhouse, and two doorless cells in the greenhouse itself,---relics of the luxurious baths which the German officers had installed therein. We had also the cellar of the Château. The greenhouse was a skeleton of twisted iron. The cellar seeped from tons of wet debris above; the explosion which had wrecked the Château had laid bare almost an entire side, the ceiling was shored up, and all the dark interior was fitted with rough chickenwire bunks and filled with straw. For even in its ruins, the Château was listed on military maps as capable of housing two hundred men. As we regarded the devastation within our own gates, we saw for ourselves the purpose of the enemy. 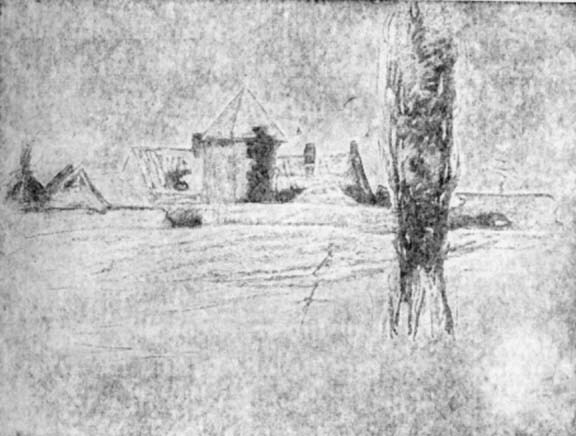 Mile after mile, village after village, the engineering corps of the retreating army had prepared this reception for the victorious pursuers; ruins in which they must shelter themselves as best they could from the rains of summer and the snows of winter, which they must share with a civilian population, homeless and starving. A squad of soldiers, loaned by the Army, was soon at work cleaning and repairing for us. The windows of the orangerie were covered with oiled paper and it became dispensary, garage, carpenter shop, gymnastic hall and general assembly place until other room was provided. The cellar was cleared and whitewashed. Here were. installed our dairy, our pantry and our supplies of all kinds. The problem of a kitchen was solved in those early days by Marie, who had a range still in working order in the hut she had built into the ruins of the lodge. She bad been forced to cook for the Germans; she cooked for us. Maurice, her sixteen-year-old son, heated water in a huge cauldron for our morning use. From the nearest village, about a mile away, came each day ZéIie, our kitchen maid, Mme. Nogent who washed for us under superhuman difficulties, Mme. Topin who sawed and chopped our wood, and Léandre, the boy who herded our cows. Grécourt itself furnished that most faithful helper of all our household (for Marie belonged not to Grécourt, but to the Château), Mme. Pottier. A typical Picarde, broad in humor, familiar, brusque, but dependable even should the heavens fall---ready, as her ancestors have it in one of their proverbs, to receive them on her pike---such was Marie Pottier, our milkmaid, factotum and friend. But it was long before our portable houses were up, or our own quarters ready for the winter---in fact, they never were ready---that we welcomed the dependents whom the French Government and the Baronne de Robécourt had so trustingly confided to us, to the hospitality of our domain. On the twenty-first of September came round the fête of St. Matthew, for seven centuries the patron of Grécourt. It was not the least part of our good fortune that we could make its celebration our first official act. The curés of the entire countryside having been called to the colors or taken as hostages by the Germans, their places in the churches were filled by the devoted chaplains of the French army of whom the world has heard so much. Privates in the ranks, pausing in the attack only to administer the sacrament to the dying, nurses, or Red Cross stretcher bearers, they added to their duties the spiritual care of the civilians in the forlorn villages where their regiments might be billeted on leave. One of these promised to come from Nesle for the mass. The service had been advertised in all our sixteen villages by the Unit which, accompanying the doctors on their rounds, sang the hymns chosen for the occasion in the deserted streets. But the villagers themselves cut the rank-grown weeds in the cemetery and trimmed the interior of the church with autumn leaves and flowers. The day was clear. The roads were dry. And from every quarter, from every shack and hovel, the country people walked to Grécourt. They filled the little church, and overflowed into the quiet churchyard. It was to be the first mass in three years! Soon the chaplain arrived in his soldier blue. Over it he slipped his vestments, arranged the symbols of the Faith upon the altar, and began the invocation. No eyes were dry in that audience; the prayer books, saved among the few treasures in the confusion of .flight, were blurred from sight. But lips moved in unison to well remembered words. The hymns, the responses, offered by the quavering voices of women and children, opposed the sound of cannon not far distant toward St. Quentin. "Ils ne l'auront, jamais, jamais, ce pays des prieux, notre France," they sang triomphant, and then, as if beseeching for husbands, sons and brothers out yonder: "Sauvez, sauvez la France au nom du Sacré Cur!" AMONG the neighbors who came to the Fête of St. Matthew was M. le Commandant Monin, in charge of our sector, with headquarters at Guiscard. To him we owed already our baraques, our water supply, our squad of soldiers, and the orders which had gone to every officer throughout the Zone to respect and aid "les dames Américaines" attached to their own army, the Third Army of France. His heart was quite won by the service. "You have begun right," he exclaimed. "Your doctors care for the sick bodies, and you who are Protestants"---this seemed to astonish him most---"have now taken thought for their souls." Thenceforth, there seemed to be no courtesy, great or small, which the Commandant did not delight to show us. Having called one day and found us without fires because we had no wood, he sent over a camion load. The Germans in the prison camps were set to work to make us tables and bureaus. At Christmas time eight hundred francs found their way to us from his purse, to be expended "just for foolishness." They gladdened many a child with candy and toys. But the extent of our dependencies, covering thirty-six square miles, gave us at Ham, the advantage of another Commandant of like kindly heart, M. le Commandant Moret. Fortunate it was for us that our immediate superiors in the Army were thus well disposed. We profited, of course, from the prestige of our sponsors, the American Fund for French Wounded. By them we had been accredited to Captain Pallain who was in charge of the service of reconstruction of the Third French Army. This was a branch of the army as definitely organized as any other. To offset the German corps of destruction, were created French corps of reconstruction. A statistical survey of the devastated area reclaimed in the spring of 1917 was one of its first cares, and was intended to serve a double purpose: to acquaint the army of occupation with its resources, and to form the first-hand testimony on which should rest demands for indemnity. It is a commentary on the good faith with which the Army received us that the military map of our own sector was entrusted to us. "Holnon, le 20 Juillet 1915. "Tous les ouvriers et les femmes et les enfants de quinze ans sont obligés de faire travaux des champs tous les jours, aussi dimanche de quatre heures du matin jusqu' a huit heures du soir (temps français). "Récréation, une demi-heure au matin, une heure a midi et une demi-heure après-midi. "1° Les fainéants ouvriers seront combinés pendant la récolte en compagnie des ouvriers dans une caserne sous inspection de caporaux allemands. Après la récolte les fainéants seront emprisonnés 6 mois; le troisième jour la nourriture sera seulement du pain et de l'eau. "2° Les femmes fainéantes seront exilées à Holnon pour travailler. "3° Après la récolte, les femmes seront emprisonnées six mois. "Les enfants fainéants seront punis de coups de bâtons. "De plus, le Commandant se réserve de punir les fainéants ouvriers de 20 coups de bâtons de tous les jours. "Les ouvriers de la commune de Vendelles sont punis sévèrement. Toward these inhabitants the army of deliverance at once assumed the responsibilities of government. Food was hurried in; private charities were facilitated in large distributions of clothing and household necessities; details of soldiers under military architects began to repair the ruins or to erect temporary houses; military doctors took over the care of public health, military labor cleared and leveled and plowed the battlefields. Everywhere a quota of army transportation, by rail and by camion, was allotted to civilian needs. For the needs of the civilians were identical with the needs of the army: housing and food. Before the war, a fourth of the wheat of France had grown in the northern departments; it was essential that this harvest grow again. Closely following the army came the civilian authorities. All of our villages lay in the arrondissement of Péronne. We therefore fell under the jurisdiction of the Sous-préfet at Péronne, and through him under that of the Préfet at the capital of the Department, Amiens. But a liaison officer between the civil and the military masters of government was essential. For instance, the sous-préfet of St. Quentin, which together with one-tenth of the territory of the Department was still in the hands of the enemy, was carrying on his administration at Ham. Army sectors cut into the ancient alignments of communes, army orders superseded civil law. Amiens itself, so far as military law was concerned, was under British rule. To meet the complexities of the hour, a special representative of the Ministry of the Interior was sent to each of the departments reclaimed by the spring drive of 1917. Fortunately for us, the special sous-préfet of the Somme, as he was styled, had his headquarters only five miles from us at Nesle. More fortunately, he was an able, brave and public spirited gentleman. Upon M. Quellien devolved among other duties the coördination of relief. As early as December, 1914, the Government, then sitting in Bordeaux, had allotted pensions to the civilian victims of the invasion. "It will not suffice us to salute the victims fallen on the field of battle. We should un-cover ourselves also before those victims, noncombatant, innocent, whom up till now the laws of war have protected, and whom, in an attempt to terrify a character which has remained and will remain unshakable, the enemy has captured or massacred. . . . France will right these ruins, counting surely upon the payment of the indemnities which we shall demand, and meantime upon the aid of contributions which the nation as a whole will pay, proud amid the distress of one part of its children, to fulfill the obligation of its common responsibility. So, repudiating the form of charity, which implies condescension, the State proclaims on her part the duty of reparation in favor of those who have been the victims in their property of acts of war, and it will fulfill its duty to the furthest limits that the financial capacity of the country will permit." So it was that every month the families of our villages went to Ham or to Nesle, to collect their allocation, or to the mayors to register claims against their future "Indemnité de Guerre." The former supplied the equivalent of bare living, the latter was good on paper for stores of furniture, or agricultural implements, or temporary houses held by the special sous-préfet in his warehouses in Nesle. But transportation was inadequate. The long anticipated allied offensive toward St. Quentin, with its massing of troops and of ammunition, the Italian reverses which sent its hundreds of thousands storming in the opposite direction, the taking over of our lines by the British and the withdrawal of the French,---among these events the wonder is that any civilian supplies came through. It was chiefly to supplement supplies and transport that private agencies had been invited by the Government to coöperate with it in the devastated areas. In our own vicinity there were already five societies at work: the Secours d'Urgence at Roye, the Union des Femmes de France at Nesle and at Ham, the French War Emergency Fund, known as the uvre Anglaise, at Nesle, the Friends and the American Red Cross. All of these like ourselves had their sectors assigned in the first instance by the Army, and continued to work by favor of safe conducts and permits renewed by Captain Pallain at frequent intervals. We were also answerable to M. Quellien, who called the directors together for monthly conferences and required of us monthly reports. M. Vernes, the representative of the Union des Femmes de France at Nesle, was the presiding officer of these conferences. He and Mme. Vernes are typical of the comparatively little known war workers of France. Far beyond military age himself, his two sons were with the colors; one of them had been killed. His factories had been destroyed. He was one of the agents sent by ,the Government on its first tour of inspection after the German retreat of 1917. He came up through Noyon, Chaulnes, Roye, Nesle, Ham and Guiscard, and he came back to live in the ruins of Nesle with his wife. Each of the relief societies, except the Friends and the American Red Cross, had a definite number of villages in its charge, so that there was no overlapping. In its assigned area, each worked out for itself its system of relief. All were on the same footing in one respect; none attempted actual reconstruction, but relied upon army shelters and army repairs, supplying, however, tarred paper, glass and glass substitutes and limited quantities of lumber to such as could use them. Thus sometimes a soldier returning home on permission repaired a roof, or set a pane of glass in the otherwise dark room where his wife or his mother had taken refuge. But the American Red Cross and the Friends had a building program in two neighboring groups of villages, and in addition the latter came into two of our villages, Hombleux: and Esmery-Hallon, to set up Government baraques. The chief function of the American Red Cross, however, was the accumulating in warehouses and the distributing to all relief agencies of large stores of supplies. Two of these warehouses were located in our district, one at Ham and one at Nesle. It was in November that the stores began to arrive, and it was a red letter day for the Smith Unit when Mr. W. B. Jackson, the Red Cross delegate, convoyed the, first camion load of hundreds of sheets and blankets to the Château. For between the time of our arrival in France and that event, practically all the relief supplies of America had been pooled by the Red Cross in one vast reservoir, from which it undertook distribution to all accredited relief agencies throughout the world. This momentous policy diverted special donations from designated objects, but on the other hand it opened enormous resources. If we did not get the boxes of clothing packed and addressed to us by enthusiastic college clubs, we received from the Red Cross in their stead money, pumps, plows, medicines: in short every requisition that could be honored by the Paris headquarters, and transportation and wholesale allotments from the local warehouses. More than that, we have had from that day to this, the invaluable counsel and support of Mr. Jackson, now Major Jackson, Director of the Field Service of the American Red Cross in France. A man who graced his position with knowledge and courage, it is such as he who have made the good name of the American Red Cross. We had other neighbors as well, our own boys. There were the Eleventh American Engineers, building railroads for the British at Le Catelet, aviators attached to the French scouting escadrille in our rear and the drivers of the American Ambulance to be met on almost any road. 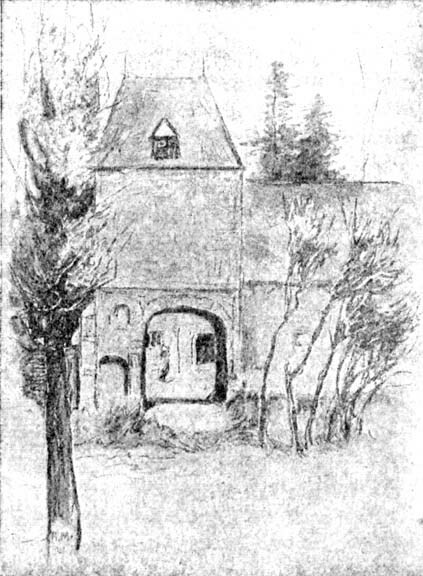 There were the Canadian Foresters in a moated old Château toward Noyon, British officers, French infantry, artillery and blue devils billeted in our villages, newspaper reporters who astonished us by dropping in to tea on their way to and from the front, and finally, as curiosity grew, celebrities like Gaston Deschamps and Coningsby Dawson, who have given the Smith College Unit a place in their books on the war. Each and all contributed something tangible to our happiness, from the Ambulance boy who walked one December day from Albert and back again, to bring us his allowance of sugar, to the foresters who saw to it that wood was not lacking for our fires, nor stoves to burn it in. Even in the days of "before the war," when Mme. la Baronne's picture galleries and dinners and hunting parties were the talk of the countryside, Château Robécourt. never entertained more hospitably than in its ruins under its American châtelaines. 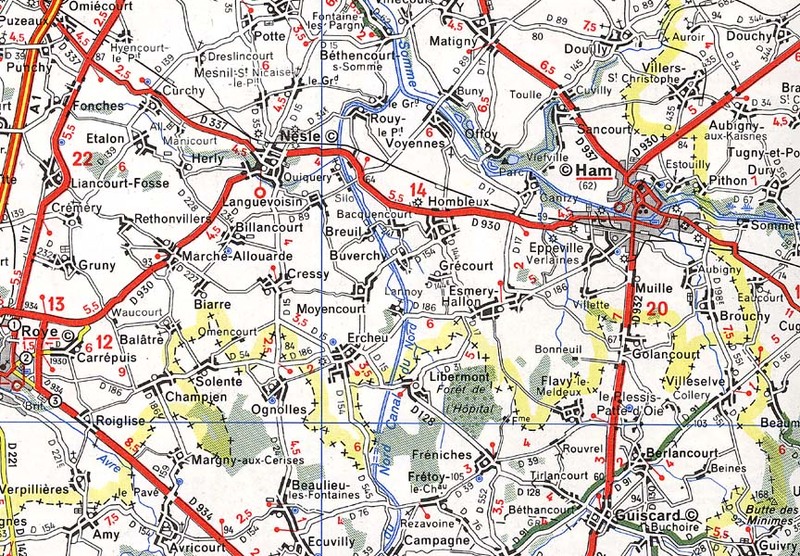 THE military map given to the Unit by the Army bore this legend: "Secteur Somme Est, Cartographie 72, 10 Août, 1917. Territoires Reconquis. État des Localités. Population et Capacités des Cantonnements a la date du 10 Août, 1917." Taking this map as our guide, we set forth to investigate our ruins. Delays in the arrival of our relief supplies, distressing in themselves, ---for there was no need of investigation to demonstrate the needs of the community--- gave us time to become acquainted with the inhabitants. Our two doctors, who refused to be discouraged by their lack of medicines, led the way in making house-to-house visits. Both spoken fluent French; in fact, Dr. Kelly, who was not an alumna of the College, was brought up and educated in France. The head of the social service department, herself a refugee from Belgium, in the summer of 1914, was also in a position to understand from experience the misfortunes of the villagers. The map gives the conditions in epitome. Comparing the population of before and after the War, one sees that out of 5,580 inhabitants, there were left in our villages in August, 1917, 1,740. These consisted, as has been said, of the old, the feeble and the children. Of these latter, we learned later, there were about six hundred under fifteen years of age. The figures again form an accurate gauge of the amount of destruction in each village. Take Breuil for example. The population is given as 150, the inhabitants as 15. One tenth, then, of its former citizens existed in the ruins. And yet in these ruins were quartered nearly ten times the normal civilian population, soldiers who swarmed in half demolished barns or in the enclosure of the dynamited Château. Destitution, overcrowding, insanitation, these are the familiar catchwords of social service everywhere. But what a background! In Breuil, the ruins were complete. On each lintel still standing may be seen to this day the circles and the crosses chalked there by the Prussians, the circle being the order to poison the wells, the cross to burn the buildings. The orders were carried out. In addition, Breuil, situated in the marshes encompassing Nesle, became a strategic point in its assault. Church, school, Château, houses, nothing but a jagged mass of bricks was left to mark its site. Buverchy, its neighbor to the south, is given on the map as having had a population of 101. Twenty-five, or one fourth only of its inhabitants, remained. Its ruins tell the story of the conflict that raged on the former highroad from Nesle to Noyon for the possession of the bridge just beyond the village church over the Canal du Nord. Only one house was left practically undamaged, that of an alleged German spy. At the other extremity of our domains, high up on the hills that look toward St. Quentin, stood Douilly. Its population of 582 souls had been reduced to 18. On that August day when the census was taken, the fields about it were red with poppies, as in March, 1917, they had been red with blood. The summit of the hill was crowned with a gaunt chimney or two, indicating former distilleries of sugar beets; the great farms---for Douilly was a village of large properties---gaped in empty quadrangles. Wherever shelter above ground was to be had, it was given over to artillery and cavalry; the remnant of the population, as their ancestors had done in many another war, lived underground. Here and there along the village street a cellar-way and a length of smoking stove pipe marked their retreat. Sancourt, our other hill town beyond Ham, had also suffered severely, though here the old church proudly faced the eastern front. Eppeville, Muille-Villette, Canisy, Esmery-Hallon, Grécourt, on the map one can read their fate at a glance. Of all our villages, Brouchy with its hamlet of Aubigny, and Offoy had suffered least; Offoy because it had been chosen one of the centers of refuge into which inhabitants of neighboring communes were herded while the latter were being destroyed, and Brouchy perhaps because of its sheltered position off the main line of march. Be that as it may, Offoy, Brouchy, Sancourt, Canisy, Muille-Villette, Grécourt and Hombleux had left to them in 1917 what the villagers prized more than their own homes, their churches. No other public buildings were standing, schools, town halls, factories, railroad stations, even the tracks and the ties in many places, had been destroyed. The impress of these ruins, cropping like wreck-strewn reefs out of the dun expanse of the plain, or etched as we turned home to Grécourt upon a flaming sky, was of an indescribable loneliness. At night, in the surf of cannon breaking rhythmically, ghostly leaves falling, falling from the plane trees, or, suddenly, the shriek of a train nearing the end of its perilous run from Amiens to Ham, that loneliness found voice. Small wonder that Marie, whose husband was fighting on the Chemin des Dames, ran out from time to time to view the horizon, or to lay her ear to the ground. Were the lines holding or breaking? Were the Germans coming back? Yet in her concern, Marie was untypical of the villagers as we saw them. Whatever their fate had been or was to be, they accepted it. Communal life was organized as usual. The postman---or postwoman---went her rounds. The mayors proper being for the most part hostages, soldiers or refugees, acting mayors were elected in their places. Three of these were women. They were both conscientious and efficient. The information they gave us formed the basis of our social survey, in the course of which we learned from a personal angle the ruin wrought by the enemy. No family but had its quota of members in slavery "avec les boches." And yet, no family but had taken up anew the struggle for existence. Gardens had been worked with trench spades, furniture of a sort had been salvaged; they anticipated a winter of privation, but a winter "at home." In short, to them war seemed a fact of nature. We ourselves were one of its phenomena. Germans, Russian prisoners, Scotch, English, red-fezzed laborers, Indian princes, impassive Annamites, their own soldiers from unknown provinces,---all had defiled along the roads of Picardy, and now, late coming, we. From time immemorial the nations had thus passed; the Celts who have left one of their rude menhirs in Eppeville, Roman legionaries buried in military cemeteries in Brouchy and Villette, the Merovingians, the hosts of Charlemagne. It was from Amiens that Peter the Hermit preached the first crusade, and from Ham and Nesle and Roye and from their fiefs, our villages, that knights and squires followed their feudal lords during a span of two hundred years to deliver Jerusalem. Blondel, troubadour of Richard Coeur de Lion, was born in Nesle, and Nesle itself, that poor ruin, was known from those days until the Revolution as "Nesle the Noble," the first Marquisate of the realm. Some say that the crucifixes at our crossroads were set there by these pious crusaders, to mark the stages of their march to the sea. Others aver that these, together with the churches, constituted places of asylum for the fugitives in that troubled country, as the chronicles have it, "never for a day without war." The Dukes of Burgundy and the Kings of France, the English and the Spaniards overran with fire and sword this plain. It was Jean of Luxembourg, Seigneur of Ham, who sold Jeanne d'Arc for a hundred pieces of gold. It was the Duke of Burgundy who desecrated the Collegiate church of Nesle in 1472 with a "brave butchery," and quitted that conquered and flaming city crying: "Behold the fruits borne by the tree of war!" In our day, the Germans bettered these their exemplars. For no military reason, they too violated the churches, profaned the cemeteries and mutilated the roadside calvaries. To us who saw with the eyes of strangers the often ragged and dirty denizens of the ruins, only their level regard, their upright bearing recalled their past. They are known to-day by the same names that one finds five centuries ago; serf or seigneur, in the end the same blood runs in their veins. In some stable, you may come upon an altar piece, an original of the fourteenth century, perhaps, or upon a copper plaque etched with the arms of Péronne. And Madame, following your eye, will say simply, "Oh, yes, they have been in my family always. I saved them in my sack." The Mayoress of Buverchy, sitting on a bench in the shed she calls her home, will tell you, with many an animated gesture, of the books they had in their library which narrated the history of Buverchy "when it was the great town of Caletot." These alas! with the village records, with the very villages themselves, are lost. The wonder grows that any land so historic should have any record or any architectural monument or any inhabitants left. Not only were there played out here the dramas of Froissart; each foot of ground formerly belonged to an overlord, temporal or spiritual. Long ago they fought one another to ruins which may be traced in eight of our villages. Canisy has its stronghold of the eleventh century, Esmery-Hallon its Priory of Bonneuil. "I know not how it is in your country," said one of our mayors one day, "but I suppose it is much the same as here, where every locality has its noble family taking the place of the ancient seigneur." Custom, tradition, these have become here in Picardy the racial monument. Nothing could be more fitting in that province of the imagination whose ancient boundaries were never geographic, but were fixed only by the extent of her ancient language, the langue d'oc of song and chivalry. So it came about naturally that we of the Smith College Unit were fitted by our neighbors into a scheme of life that they could understand. 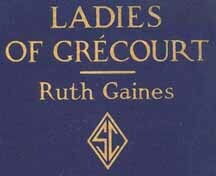 In spite of our unwonted, not to say peasant occupations, of uniforms, of masculine strength of hand, we were given throughout the countryside the sounding yet affectionate title of "les Dames de Grécourt."